Today I am sharing an aerial photo of Jerusalem that shows the entirety of the Old City. The 16th century Ottoman walls can be seen along the south and west of the city. Jerusalem from the air. View north and east. Photo by Ferrell Jenkins. The view is toward the north and east. You can see that the Judean wilderness is near the city of Jerusalem. Notice that the city is reflected on the wing of the plane. If you look carefully you can see the reflection of the Dome of the Rock and a portion of the Temple Mount. Click on the photo for a larger image. The image is large enough to use in presentations for teaching for those who are willing to spend some time studying the location of various Bible events. 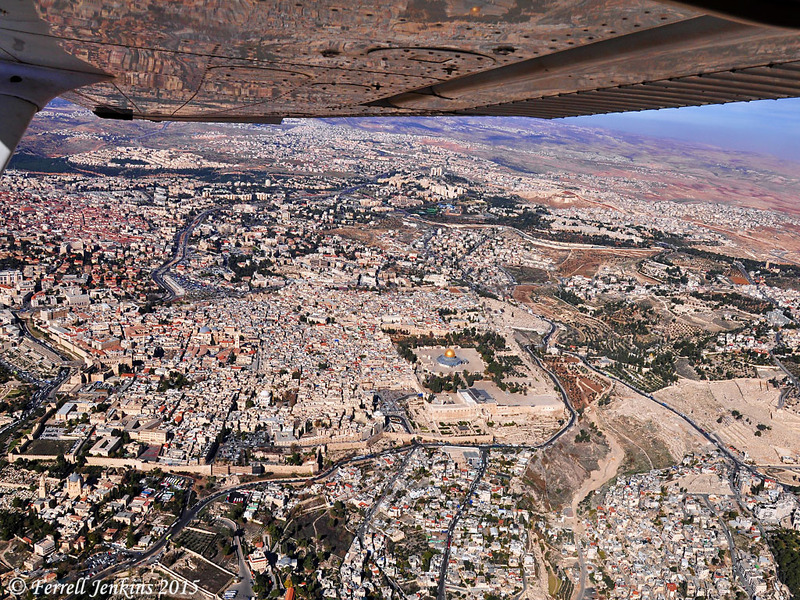 This entry was posted in Bible Places, Bible Study, Israel, New Testament, Old Testament, Photography, Travel and tagged Aerial photography. Bookmark the permalink. Wow! Jerusalem always looks a beautiful city, and yours is a really interesting image. I see the trees around the Dome of the Rock, and have seen trees also in other pictures of the Temple Mount. Most of the drawings and recreations of the Jewish Temples show the court around the Temple bare of trees, almost paved over. Do we know if there were any trees in the Jewish Temple compounds, or not any trees? On a tour, this is not a view that you will see. It gives a wonderful perspective of the old and new city. The old city of David is at the bottom of the picture in the center running up toward the Temple Mount.